During January-March 2019, Jakarta Manpower and Transmigration (Nakertrans) Department together with PT. Bank DKI have distributed 5,639 worker cards. While in 2018, Nakertrans Department has distributed 3,070 worker cards.
" 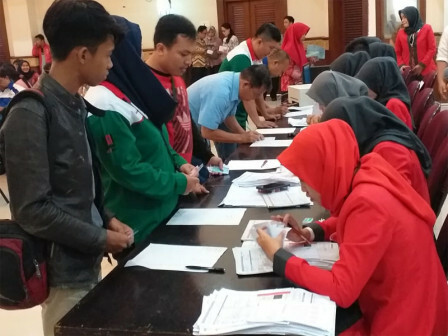 We are targeting to distribute 24 thousand worker cards this year"
According to Jakarta Nakertrans Department Head, Andri Yansyah, his side has reached the target to distribute minimal 5,000 worker cards in these three months. "We are targeting to distribute 24 thousand worker cards this year," he asserted, Monday (4/1). He explained, worker card holders can get benefits such as free ride on Transjakarta bus for all routes, staple food subsidy, education assistance fund for their children in form of Jakarta Pintar Card (KJP). Currently, his side has verified 9,719 workers data and other 13,517 workers data are still waiting to be verified. "9,358 workers who have proposed to get worker cards are passed the verification process. Later, their data will be sent to Bank DKI," he added. Nakertrans Department and PT. Bank DKI are committed to print the card within two weeks after applicant data have been verified and accepted by Bank DKI. "We want worker who deserves it can get this card immediately and get the benefits," he mentioned. Regarding distribution, Nakertrans Department and PT. Bank DKI coordinate with labor unions and companies thus worker card distribution doesn't interfere work or company operational.